Orissa is a most visited state in India. Bhubneshwar, Puri and Konark are the Golden triangle of the Orissa visited by large number of pilgrims and tourists.The Konark Sun Temple in Orrisa, India is very well known for tourists attraction and its sculptural work. This was also referred as the Black Pagoda by European Sailors due to the dark colour. It has been a World Heritage Site since 1984. This Hindu temple was build in 13th centuary by Ganga ruler king Narasimhandeva. It is situated at the north eastern corner of Puri. The name Konark Sun Temple is derived from two Sanskrit words Kona and Arka where Kona means Corner and Arka means Sun that’s mean Sun God is worshipped in Ark kshetra is called Konark. Konark is also known as Arkakshetra. Sun has been a deity in India from vedic period which is described in Rig Veda regarding prayer of Sun god. Konark temple is in the shape of colossal chariot, carved twelve pair of stone wheels pulled by seven horses, carring the Sun God(Surya),across heavens. The diameter of wheels is about 10 feet. The enterance of the temple is guarded by two huge lions and elephants. This temple was built at the mouth of the river Chandrabhaga. 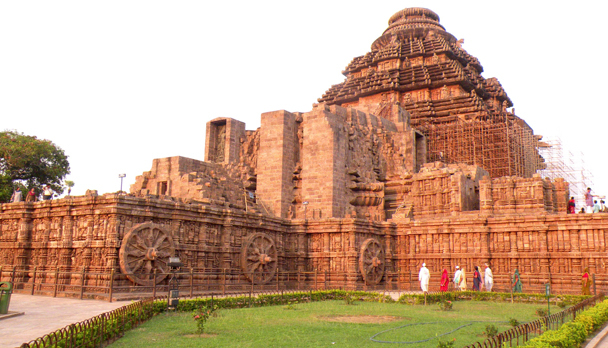 The konark Sun temple is totally profusion of sculpture work and made by khondalite rocks. The walls and roofs are carving in beautiful style. The sculpture work of images of animals, men, warriors on horses, foliage and other interesting patterns. It is follows as traditional style of Kalinga Architechure. Two temples are discovered while constructing this temple in which One of the ‘Mayawati Temple’ is found while removing sand and debris and second one is Nata temple where the sun’s rays reached everyday. There is a heavy magnet placed at the top of the temple and the stone of the temple is sandwitched by iron plates. The ‘Konark Dance festival’ is celebrated every year which is very great tourist’s attraction and the ‘Konark museum’ also have the good collection of sculptural work.